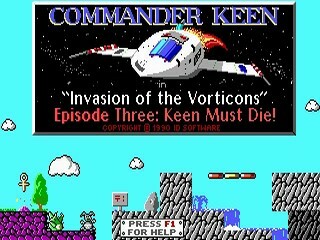 ﻿ Speed Demos Archive - Commander Keen Episode III: Keen Must Die! Released in December of 1990 for the best gaming system by id Software, Commander Keen: Keen Must Die! is the third in the trilogy of the original Commander Keen games, where you take control of Billy Blaze as he attempts to find the mysterious Grand Intellect who sent an army of dog-like humanoid aliens to attack earth. Spoilers: It turns out the Grand Intellect is his rival at school, and has an IQ one higher than Billy does. The plot is a little bit silly. Best time: Single-segment 0:01:59 by Arturs 'Xarthok' Demiters on 2013-02-20. I first speedran this about aeons ago and got a 2:17. Then sirhenryjones on YouTube beat it with a 1:59 and I thought that run to be unbeatable, the boss fight was incredibly accurately played. 6 years later I revisited it and a few days later ended up with this short but fun run. 2. Caves of Oblivion: Somewhat good, could shave a half second or so. 3. Castle of the Grand Intellect: I think you can hit the bottomright target a cycle earlier with incredible accuracy and perhaps save a second. Other than that it went pretty optimal with no shots missed, yay!